Not all that long ago, simulation software was only available to a select few for military decision-making, architectural analysis and flight simulation, where a mistake could costs a lot of lives or money or both. 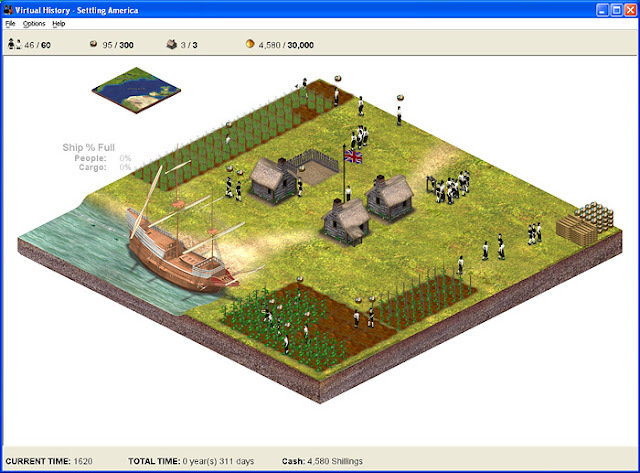 Business simulation games such as Railroad Tycoon and Sim City were the first to reach the population at large, transfixing players with convincing virtual environments designed to entertain, but they were not geared to specific, measurable, teaching goals and it was only a matter of time before software developers set out to harness the appeal and complexity of computer games to teach and assess business skills. Knowledge Matters introduced its first product, Virtual Business – Retailing in 1999, and the company now has two other software-based simulation Virtual Business (VB) programs, VB – Sports and VB – Management (VBM). My previous post addresses exactly this suite. After eight years of success, the lessons learned in business simulation are also being applied to historical simulation. Knowledge Matters released late 2006 a simulation on ancient Egypt for middle school students (grades 5 – 8), the first in its new line of educational simulations for social studies. The product is based on techniques honed with the three Virtual Business products used by half a million students in 3500 middle and high schools. The multi-level , 5 – 7 day, Virtual History - Ancient Egypt module is intended as a capstone to a traditionally taught section on ancient Egypt. Designers used depictions from 4000 year-old cave paintings to build realistic experiences of daily life along the Nile. Students assume the role of village leaders who assign work tasks, monitor signs from nature, construct housing, and provide food and protection for their ever-expanding population. The students’ decisions determine whether their village succeeds or its inhabitants die of starvation. Assessment tools include quizzes and tests administered throughout. 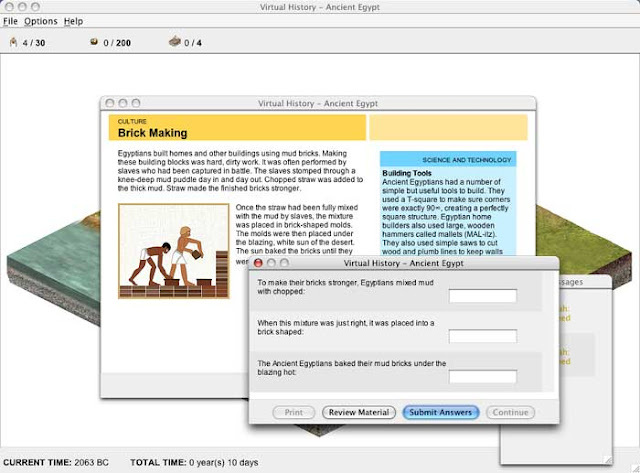 Virtual History – Ancient Egypt is now being followed by programs centered on early settlements in America, ancient Greece, and westward expansion. Even with a three-fold increase in use anticipated for the business and history sims, however, Eric Olsson, KM’s vice president, who joined the company shortly after Retailing entered the market, and a former teacher himself, explained that the company’s products are part of a still-fledgling cultural change in the educational sector. Still, he said it’s a movement that is gaining momentum and pointing schools toward more interdisciplinary approaches to teaching and non-traditional teaching tools. Taught through a series of mini-tutorials within the sim (a student must pass a threequestion quiz before moving on), these historical facts touch on economic variables, technological advances, and available resources, among others, and lead to specific benchmarks that must be achieved. Students must successfully farm and refine grain to make bread and consequently feed the village, for example, but must also avoid the destruction of crops and the loss of lives to the annual flood of the Nile. And in the final level of the sim, students can only successfully construct a pyramid after they have secured the necessary manpower, tools, and materials. “Students can employ different strategies to achieve goals and address problems,” Olsson explained, noting that they can even change history with the right set of decisions. “Sims have a very real leveling effect,” said Jordan, likening the work students put in to increase their convenience store’s profits or tame unruly fans at their arena to a game of golf. “It doesn't matter how pretty you look getting the ball in the hole, as long as it goes in. It’s the same for these kids … it doesn't matter how they increased their profits, it just matters that they did.